Special Price till End-of-December (or until stock runs out). The APC-45 Cisco EHS supports the Cisco SPA900 Small Business IP Phones (also known as Linksys). It also supports the Cisco SPA512G, SPA514G and SPA525G2 ( with 7.5.1 software release and above) . 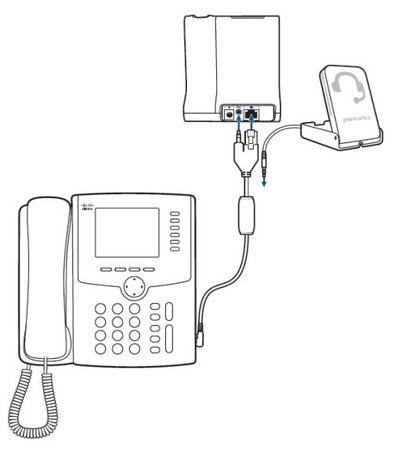 For 79xx Cisco phones use the APC-42 EHS Cable, for 8961 and 99xx Cisco phones use the APU-71 EHS and for Cisco 8945 phones use APC-82 EHS Cable. The Plantronics Cisco APC-45 EHS works with the following Plantronics wireless headsets: CS510, CS520, CS520, CS530, Savi 700 series, Savi WO300 & Savi WO350.